Families come to trust Memoria Press for a variety of reasons. We came through desperation. Our oldest child did not speak until he was five, and he and his younger sister have significant receptive and expressive language difficulties. Finding a good, solid education for them was literally bringing us to our knees. We knew we wanted to homeschool. But having children with special needs threw another kink into things that we had not foreseen. How on earth would we teach them? We knew of no one who homeschooled special-needs children. It was just a matter of course that parents would hand these children to the state or an expensive private school to be educated. Yet even though the public school system had a wealth of “programs,” we were not satisfied. From what we researched, our children would be taught “life skills,” self-care, and sharing, but the emphasis on their actual education would not be strong. They would primarily be taught through screens, apps, and keyboarding, with little emphasis on penmanship or reading above their level. And godly character development was all but prohibited. They would, in short, not be encouraged to excel. Neither would any special talents they possessed be fostered. Further, if they were “mainstreamed” into a “typical” classroom, they would be expected to conform to the “sit still and listen” paradigm that the public school enforces. This meant, for my older son especially, that there would be major discipline problems, and likely a strong “recommendation” of medication. Our children would not climb trees, would not go to the zoo and spend time as they wished, would not relish the sunrise or laugh wildly and dance in the first snowflakes of the season. These are arguments in favor of homeschooling for even typical children. But it was of huge importance to us. Our children have special needs—that doesn’t mean they should be deprived of what every other child enjoys. If anything, they should be encouraged—even pushed, within their comfort zone—to get out into the world. It is hugely important for them to be familiar with its workings and how to operate in it. Otherwise, once they are free to roam it as adults, they will be lost and vulnerable, trapped within familiar, rigid routines that were forced upon them by well-meaning programs. Being indoors all the time, herded from program to program, is suffocating to the soul. Besides, how can a child who cannot communicate tell us if someone is mistreating him? How can he tell his teachers? What if his teachers mistreat him? Who would ever know? No amount of “free services” were worth that risk. The two private, special-needs schools in our area were not much better, even with “in-house” therapy included in their steep tuition. I would have had to go back to work so we could afford it. And our younger children would have had to go to daycare. Additionally, their syllabus and sample schedule read like the operation of a prison camp—would I were exaggerating. We were pushed against the wall. And there were so many unknowns. But I did know this in the depths of my heart: My babies needed to be home, getting a quality education from someone who loves them, knows them, believes in them, and would be willing to push them to be excellent as far as they can go. I had no idea how we were going to make it work, but I was up for the challenge. So we took the path “less traveled” and embarked on home education. I come from a family of teachers, but I am not one. I have an English degree, but it is not in education. Yet anything worth doing is worth failing at, so I started researching. And my research yielded a harsh reality: There were no special-needs homeschooling programs. That pounded in my head and heart like a hammer on nails. No help. No systematic approach to education for my children. I had to take the best I could find and modify it. One or two companies had a person on staff who would “work with us” to modify their curricula, but they were only equipped to help with dyslexia or math difficulties. While those are significant struggles, we needed true help—my son spoke mostly through echolalia and understood very little. We needed open-and-go lesson plans with a forum to ask questions and get specialized advice from someone who cared. But it didn’t exist. So I put together my own program, piece-meal. I did not know what I was doing or how to do it. We did okay that first year; we saw progress. But I wanted more. I wanted an excellent education for my son and his siblings—just like every other parent wants for their children, typical or not. 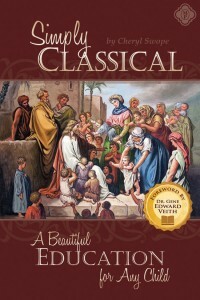 Enter Simply Classical: A Beautiful Education for Any Child. It was, in a way, like reading the Gospel for the first time. Suddenly, I had hope. Someone had been where I was and had succeeded. I cried. I was relieved beyond measure. This could be done! But the question remained: How? 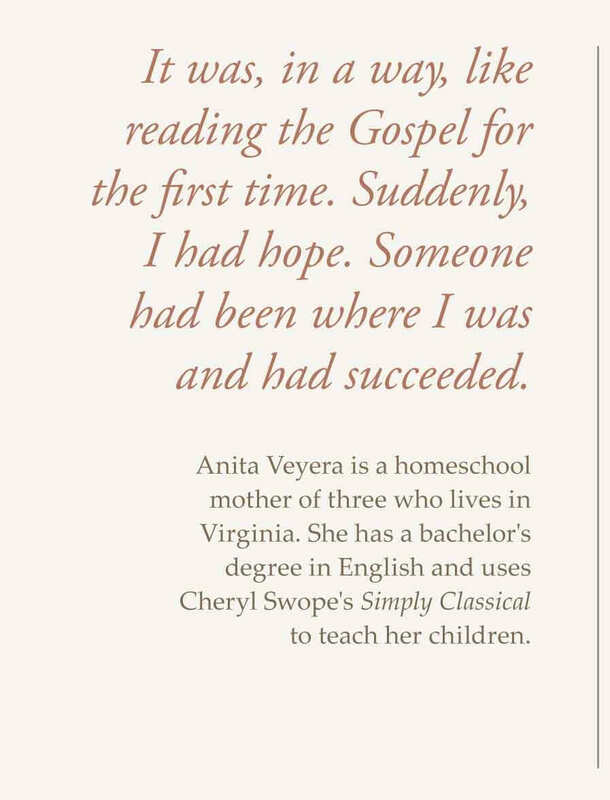 Thankfully, Memoria Press took the spark of Cheryl Swope’s extraordinary teaching experience with her own special-needs children and created the Simply Classical Curriculum. We started a little over a year ago with all three of my children. All have seen significant gains, especially my older son. When we started, he didn’t know where the sky was, much less whether it was cloudy or rainy. Now he knows the seasons, what happens in each, the months of the year, Scripture, and poetry. My precious son, who has only been speaking for three years, loves phonics and math, is reading simple sentences, and has gorgeous handwriting. It is startling how far he’s come. We are so thankful to Memoria Press and everyone who makes a classical education available to all, not just a few. You give me hope!!! Thank you so very much!